Bridge of Eldin across the Smash series. Bridge of Eldin (オルディン大橋, Oldin Great Bridge) is a stage in Super Smash Bros. Brawl, Super Smash Bros. for Wii U, and Super Smash Bros. Ultimate. Bridge of Eldin is normally completely flat, reaching both lateral blast lines. Occasionally, a horn is heard: King Bulblin then rides across the stage, dealing damage to any fighters he rides into. He can be attacked - if damaged enough he just passes by, otherwise he drops a bomb in the middle of the bridge. Once the bomb explodes, dealing damage and massive knockback to nearby fighters. Additionally, it will destroy the entire middle part of the bridge, creating a pit with grabbable edges. A Bulblin may appear, following behind King Bulblin as he rides through. Unlike King Bulbin, it cannot harm players, and can actually be stunned if attacked - if damaged enough or caught in the blast of the bomb, it will be knocked away. After a short while, a Twilight Portal appears in the sky and restores the bridge to its complete state. In Super Smash Bros. 4, the stage is larger with the bridge extended and a deeper bottom blast line. This is noticeable through Fixed Camera Smash. In 8-Player Smash, King Bulblin does not appear and the bridge is never blown up. This also happens if stage hazards are turned off in Ultimate. In Super Smash Bros. Ultimate, Ganondorf is fought here for his unlocking battle. In Super Smash Bros. for Wii U, the Ω form is set on a portion of the bridge that has two columns supporting it that extend below the blast line. Walk-offs and King Bulbin are absent. In Super Smash Bros. Ultimate, the main platform of the Ω form and Battlefield form are similar to SSB4's Ω form; however, it no longer has two columns supporting it, and it is resized and reshaped to match Final Destination and Battlefield, respectively. The three soft platforms are made of stone and are unique to the Battlefield form. Bridge of Eldin as originally seen in The Legend of Zelda: Twilight Princess. 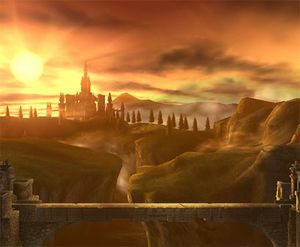 This stage is based on the Bridge of Eldin that appears in The Legend of Zelda: Twilight Princess. It is situated over a large canyon with Zora's River running through it, and it connects the northern part of the Eldin Province to the large field in the southern part. After Link traverses the bridge for the first time, a large section of it is teleported away by Twilit Messengers. Later in the game, Link and Midna find the missing piece in the Gerudo Mesa and teleport it back via a Twilight Portal. Bulblins, a race of goblin-like creatures, are a common enemy in Twilight Princess. Their leader, King Bulblin, is fought several times throughout the game, one of which takes place on the Bridge of Eldin. 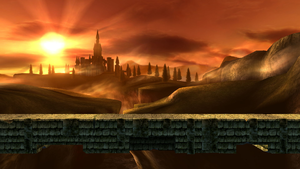 This stage's sunset setting is a reference to this battle with King Bulbin, which ignores the normal day/night cycle and is always set at sunset; however, the bridge's destruction has nothing to do with King Bulblin in Twilight Princess. Bomb Barrels appear in several Zelda games, including Twilight Princess, in which they are marked with a large white X. They usually act as damaging hazards, but they are not used by King Bulbin. They also do not generate a large explosion, though The Legend of Zelda: Majora's Mask features a usable version, the Powder Keg, whose powerful explosion can destroy large rocks or walls that block the path. The stage is almost always banned in competitive settings because it is possible to walk off into the blast line, which allows for camping and easy KOs, especially via chain grabs. Because of this, King Dedede and Ice Climbers had disproportionate advantages on this stage. In addition, when the center of the stage is destroyed, players - especially those with great recoveries - can camp by moving from one end to the other. 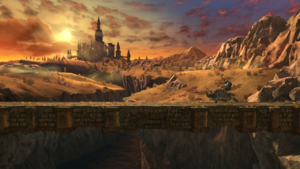 The Bridge of Eldin is known for various glitches that involve using Final Smashes in the destroyed bridge area as the bridge reforms: these are specific cases of the regenerating terrain glitch, which was fixed in Super Smash Bros. for Wii U. If a character uses a Final Smash that suspends them in midair - such as Donkey Kong's Konga Beat - while the bridge reforms around them, they'll be able to move inside the bridge until they jump out of it or fall through the bottom. The player can also use Jigglypuff's Final Smash to remain giant - even after the Final Smash is over - by inflating in the broken bridge segment while it is being regenerated. If Yoshi then uses Egg Lay on the giant Jigglypuff, the Pokémon will grow to a size that doesn't fit on the screen. Jigglypuff's hitbox remains her size, making it easy to get KO'd especially after Yoshi's Egg Lay. King Bulblin and Lord Bullbo appear on the bridge. The bridge breaks from a bomb explosion planted by them. Wario riding his bike behind Bewear on the stage. Cloud posing on the stage. Cloud and his Advent Children costume idling on the stage. Sonic holding Death's Scythe on the stage. Ganondorf on the stage in Ultimate. Donkey Kong being taken away by Kapp'n on the stage. Lucario attacking Squirtle with its dash attack on the stage. Luigi performing his neutral aerial on Wario on the stage. Diddy Kong and Lucas stunned by Marshadow's Spectral Thief on the stage. Ness idling on the stage. Pit initiating his Final Smash on the stage. Richter straightening his whip on the stage. Toon Link confronting Bowser on the stage. Little Mac performing his up taunt on the stage. Ganondorf watching the Moon crash down onto the stage. This page was last edited on April 16, 2019, at 05:16.